STOURPORT-ON-SEVERN, UNITED KINGDOM, August 21, 2018 /EINPresswire.com/ — Elderly folks abound the large houses in a small suburb of Oxford during the Second World War. To the amusement of a girl who lived in a flat upstairs owned by a physically-challenged Grandmother. Her journey from a sickly girl taught in a local infant’s school and sent to a boarding school opened her world to life's dimensions. Author Exona Moll narrates a life filled with mystery and seemingly unfitted lifestyle in her book "Square Hole for a Square Peg". The big question lies: Have you worked really hard to get where you are and still feel like you just don't quite belong there? Does your life feel a little like an old pair of pants that you just can't get rid of? Moll narrates what everyone has gone through in life, the alienation and the need to fit among others. This book reshapes reader’s mind and hearts that altering oneself might changes lives and might drive you out of alienation. Moll redesigned her path that made her successful and rises above all life’s challenges. She writes her story to create an impact on someone else lives. My life seemed of no particular use. I did not fit in well with my fellows around me. Over time I decided, rather than try to alter myself, I would try to alter my surroundings. After achieving a degree of success I thought it might be helpful to others, to write my story down. 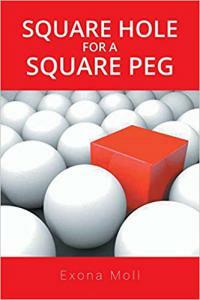 Hence 'A Square Hole for a Square Peg' came to be written.